I’ve just returned from a trip to Florida and realized it’s already time to start giving you guys some recipes for fall! Even though Arizona doesn’t cool down until October, it’s beginning to look a lot like fall for the rest of you. My favorite time of year. 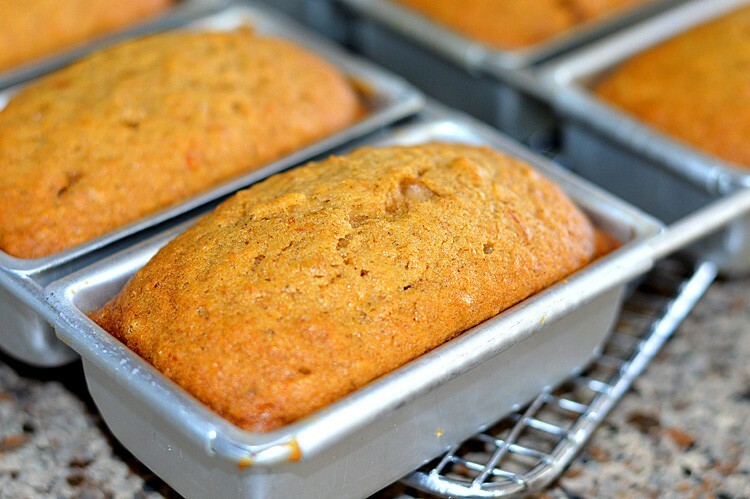 This Brown Sugar Butternut Squash Bread was an experiment of sorts, but can I just tell you…my house smells A-M-A-Z-I-N-G. 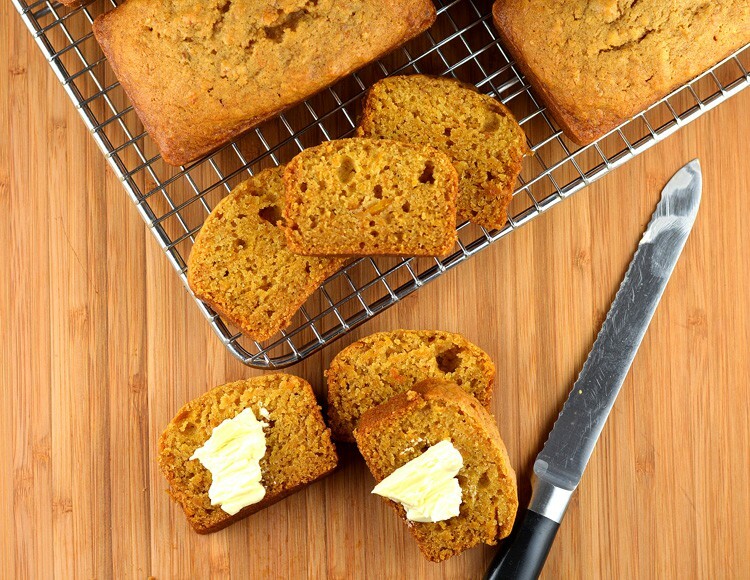 This bread is not unlike a pumpkin bread, but instead of pumpkin, I used roasted butternut squash that I seasoned with my homemade pumpkin pie spice blend. I added a pinch of black pepper for added spice and of course, brown sugar. Applesauce is our egg-replacer in this recipe and also adds moisture. The first step is made easier by a good vegetable peeler. I’ve mentioned this one before, but a good vegetable peeler not only eases peeling oddly shaped produce, but also reduces waste. I found mine on Amazon and I absolutely love it. Cut off both ends of the butternut squash and peel until you get to the darker orange color. I then halve the squash and remove the seeds. Cut into cubes and sprinkle with the seasoning mixture. I tossed with 1 teaspoon of oil and baked at 400 degrees for about 30 minutes. I then added a few tablespoons of water to the pan, tossed and baked until they were just fork-tender. The squash is cooled for a few minutes and transferred to the mixing bowl. Beat until you get a smooth puree and add the remaining ingredients. Spoon into desired loaf pan(s) and bake at 325 degrees until a toothpick inserted comes clean. This recipe makes 1 standard loaf or 6 mini loaves as I’ve done here today. If you’ve followed me for awhile, you know I am obsessed with this Wilton pan (found on Amazon). I wrap the individual loaves in foil and freeze. 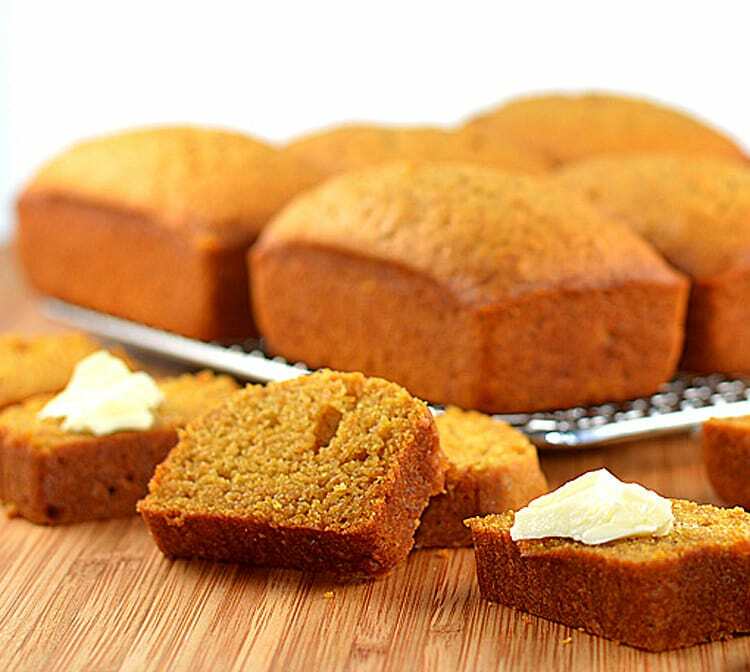 These cakes are very moist, so cool for only about 10-15 minutes in the pan and immediately remove to finish cooling on a rack. These were difficult to resist biting into when warm. I don’t know why, but I prefer to refrigerate my breads. I like them cold with a dab of vegan margarine. Soooo good! Prepare baking pan by spraying with a non-stick cooking spray. 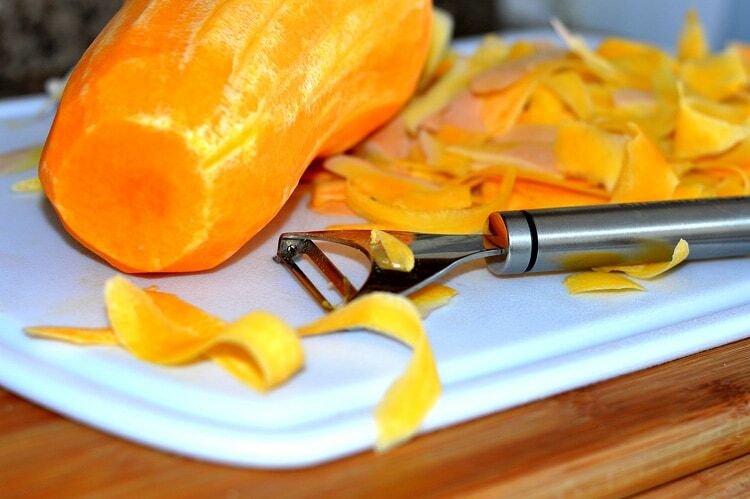 Cut the ends off of a butternut squash and peel away enough of the skin to reveal the bright orange flesh. Slice in half lengthwise and remove the seeds. 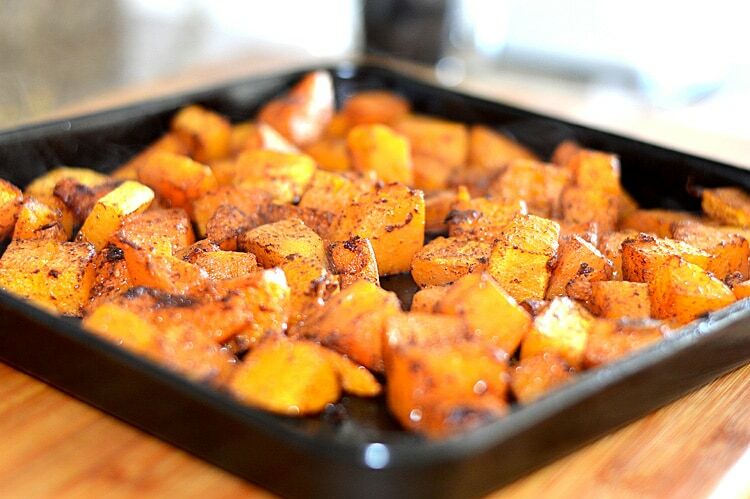 On a baking sheet, add 1-2 tsp Oil and the squash. Toss with the spices and bake at 400 degrees for 30 minutes. After 30 minutes, add 2 Tbl water and toss. Continue to bake until fork tender. This will depend on how large you cut the squash. Once complete, remove to a rack to cool slightly. Meanwhile, reduce the oven temperature to 325 degrees. In the bowl of an electric mixer, add the squash and beat until you get a smooth puree. Add the remaining ingredients. Do not over beat. Spoon into a loaf pan (or evenly distribute amongst mini pans) and bake for 1 hour to 1 hour 15 minutes for a standard loaf pan (or 30-35 minutes for mini loaf pans). You will know they are done when a toothpick inserted comes clean and the edges are golden. Allow to cool in the pan for 10-15 minutes. Remove to a rack to continue cooling completely. Once completely cool, wrap with foil. This is a very moist bread, so I like to refrigerate. 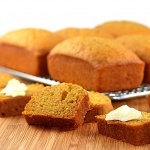 If you are doing the mini loaves, wrap individually and freeze. Serve with a dab of vegan margarine. I made this bread and it turned out beautiful and delicious! It smelled amazing! My family and I were super excited about having a new fall recipe to enjoy. I plan on making this bread for Thanksgiving and for family and friends (in the mini loaves). I found this great vegan recipe when I was looking for a something to do with extra butternut squash that a church friend gave to me from her garden. I encourage all to try!! My daughters are vegan so I’m always looking for vegan recipes. This is Fabulous! My husband (extremely non-vegan) loved it too! I bought the squash already cut to make life easier! I just took my loaf out of the oven and it smells great. I did not use the oil, I added more applesauce and added some chopped walnuts. Can’t wait to slice it!